Computer Science Education Week is a great opportunity to reflect on our community's CS Ed efforts. We want our audience and yours to learn more about the need for tech talent and the importance of computer science in preparing that talent. Meet Cassie. Cassie is a Kansas City native and friend of the KC Tech Council, pictured below! She is passionate about computer science education and is visiting local tech organizations to help them educate their audience during #CSEdWeekKC with social content. Learn more about Cassie, CS Ed Week and find instructions to use Cassie yourself below! My name is Cassie. Kansas City is my home and computer science is my passion. That's why CS Ed Week is my favorite holiday, and I look forward to celebrating it with you! The demand for computer science skills is growing twice as fast as the supply, and it's important that leading organizations are part of the solution. 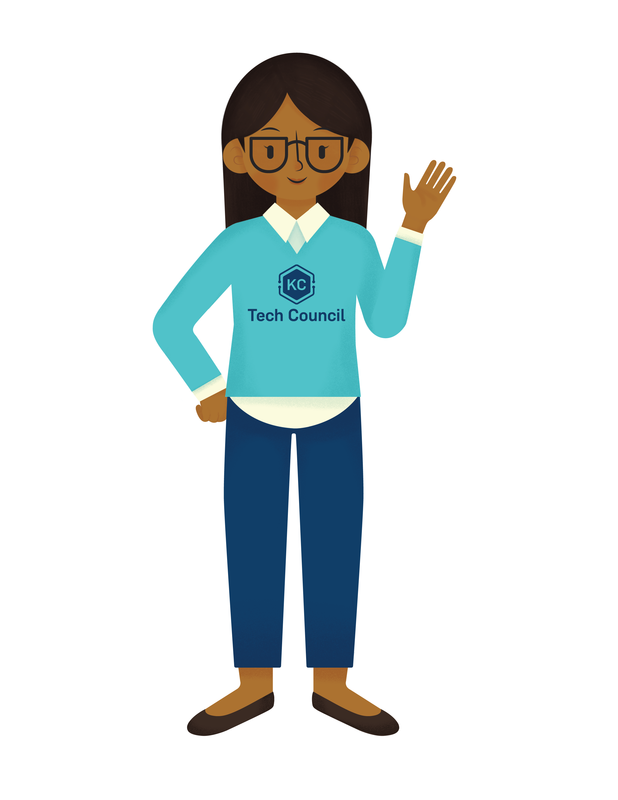 My friends at the KC Tech Council are sending me to local tech companies to help increase awareness of the skills gap, encourage folks to support computer science education, and spread the word about opportunities available here. Let's share the stories of tech careers in Kansas City! Share a story from your office about how computer science education has impacted an employee. Explain how your organization or the employees support computer science education. Using kctechspecs.com, Code.org, or your own reliable source, share a surprising fact about computer science education. Show off your pro-CS Ed company culture and how Cassie is getting along in the office. Give your followers a call to action! Encourage your audience to enroll their students in CS Ed courses, host an hour of code, or spread the word themselves. 1. Don't forget to use the hashtag #CSEdWeekKC! 3. Be creative. These prompts are broad suggestions. If you have other fun ideas to spread the word about CS Ed, go for it! 4. Use this as an opportunity to show off your culture, employees, office space, or whatever makes your organization unique. 5. Do some light research using the resources mentioned in the prompts to keep posts engaging and relevant to computer science education. 6. We're pretty sure you already know this, but just in case, keep it classy. Please don't share anything Cassie's grandma wouldn't approve. ‪Cassie is a friend of KCTC who is passionate about computer science education, and a he’s visiting local tech organizations Dec. 3-7 to celebrate #CSEdWeekKC.‬ ‪Follow the hashtag to see what she’s up to! We can’t wait for you all to meet her. 🤗‬ Sign up to receive your own Cassie in the mail by this Friday, Nov. 23! Link in bio.